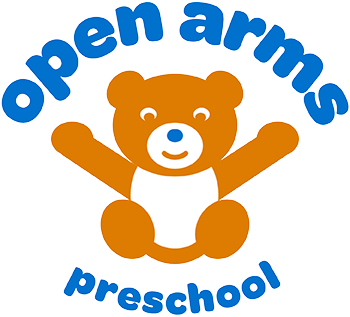 "Open Arms Preschool is fabulous! My daughter looks forward to her school days, runs right in, and always comes out smiling. In just a month she is thriving and learning new things. She loves her teacher and her friends. I love the variety of activities and the opportunity for her to play with kids her own age. I give this preschool 5 stars!" "I am very fortunate to have my daughter in Open Arms Preschool. The director and her staff are friendly and caring, with impressive educational backgrounds, as well as a great deal of experience in child care. The environment is warm and fun, ideal for children to create and learn. I am grateful for the individual attention my daughter gets, providing her with the guidance she needs. When I see her growing from week to week it reassures me she is in the right place. I love watching her big smile as we enter, most certainly with open arms. Thank you Open Arms Preschool!" "Open Arms is a remarkable gem of a preschool! Small class size and low student/teacher ratio, loving & deeply invested teachers, brand new classrooms, and a community of friendly parents. Miss Misa is a warm, nurturing, and highly educated teacher with both elementary and special education degrees, which is a rare find. Our son LOVES this school, and we love the fun, gentle play-based learning environment where our son's social skills and language skills have blossomed. Compared to the other larger, louder, not-nearly-as-personal preschools we looked at in the Gramercy / Union Sq area, we thank our lucky stars we chose Open Arms and the welcoming community that surrounds it." My daughter has been attending the Playgroup at Open Arms since before she turned 2 and we love it there! I wasn't comfortable sending her to a drop off program yet, so my caregiver attends with her, which is amazing because she gets the structure and environment of a preschool without separation before she is ready. The teacher, Miss Kim, is great with the children. They do crafts, sing songs, learn colors and numbers, read books, & have free play all at a pace perfect for this age group. My daughter looks forward to going to "school" every week, and I hope this experience helps her grow to love preschool when the time comes. I would definitely recommend this program and school to anyone looking for a fun, safe, happy place to send their children! Our daughter has been at Open Arms Preschool since September and we could not be happier. When we drop her off, we know she is in a safe and nurturing environment where the teachers deeply care for their students. The newly renovated classrooms are bright and colorful which makes it a fun place to learn. At pick-up, my daughter comes out jumping with excitement. The class size is small and the individual attention is big. The Director and teachers all love what they do and it shows. We are very fortunate to be a part of the Open Arms Preschool family. I booked my daughter into Open Arms Preschool prior to moving to NYC. When we arrived, I realized that the location was quite a distance from where we were living. I was planning on looking somewhere closer, however when I arrived at Open Arms, I immediately fell in love with it (as did my daughter). It is a small preschool with small class sizes which makes the experience much more personal than bigger centers I have experienced. The teachers are so lovely and caring. I have no hesitation dropping my little one off into their care. My daughter loves Open Arms and happily farewells me each day. She already tells me how much she is going to miss Miss Natasha and Miss Kim when she leaves for PreK. She will often tell me facts about the weather or days of the week and proudly tells me that she learnt it at preschool. I highly recommend Open Arms if you are looking for a caring, safe, educational and fun environment for you child! Open Arms Preschool has been a wonderful experience for our family. As our daughter is our first child, we came to Open Arms new to the whole NYC preschool scene. Misa and her team were very warm and welcoming from the get-go – and very patient with any questions we had! All of the teachers take time to get to know the children, and it is evident each one of them has a passion for what they do. We have really seen our daughter grow during her time in the 2s program at Open Arms – she started out shy and reserved and now doesn’t stop talking about what she did at school! She has also learned so many new words and concepts during her time here. Open Arms exposes children to new concepts through play, music and other sensory activities, and this has really helped our daughter to grasp and retain what she learns at school. Misa is also very communicative and keeps the parents informed of the school’s activities and daily happenings – something we really appreciate as full-time, working parents. We cannot say enough good things about Open Arms, and have truly valued our time at the school. We love Open Arms! My daughter Aila, now almost 4, is in her second year at Open Arms Preschool and has attended since she was 2.5 years old. She loves going to class and eagerly goes about her daily routine of placing items in her cubby and washing hands before jumping into playtime. From the start I was impressed with the willingness of the Director, Misa, to work with us on tuition and affordable monthly payments. The teachers are all so wonderful with the students and have been instrumental in guiding me through the different developmental stages. At the beginning of this year Aila was struggling with her behavior, stemming from sibling rivalry and sleep regressions. Any and all issues that arose, either at home or in school, were met with compassion and encouragement. With daily updates and feedback, we were able to learn what types of stimulation my Aila responds to. I can utilize tactics and tools from the classroom at home, and vice versa, so that she has consistent praise and consequences, and her behavior has improved markedly. Were it not for the kind and pragmatic approach by Miss Misa and Miss Natasha, I would have had a much harder time reeling in my ‘three-nager’. I encourage anyone I know who’s looking into preschools to visit Open Arms. This little school holds it’s own among the plethora of options, and really stands out as a gem. My daughter Emma has been attending Open Arms Preschool for two years now and absolutely loves it. The teachers are extremely experienced and caring. It's not just a school but a family and each child receives individual attention tailored for growth. I have seen Emma blossom in this school and I can't wait for my younger daughter to start there next year. I highly recommend it!